Sometimes the most simple projects are the most time consuming. I finally finish my Thanksgiving wreath. Initially i was obcessed in making a baby pine cone wreath, BUT a bag at Marshalls with maybe 7 gigantic pine cones costs $5 dollars. When I made the math, I just realized the total price defited the DIY motto of my life. I went instead with hazelnuts. To be honest… I am pleased with the end results. For this project you basically need: 1 foam wreath, 4 bags of hazenults from any groceries store, glue gun and sticks, brown ribbon and any flower decoration from a dollar store ( optional ). Start by wrapping the foam with the ribbon. I like doing this so the final product looks sharp and you dont have foam floating around when gluing the hazelnuts. Then, start gluing the hazelnuts. Make sure you do that when you are watching your favorite show because it takes f.o.r.e.v.e.r. 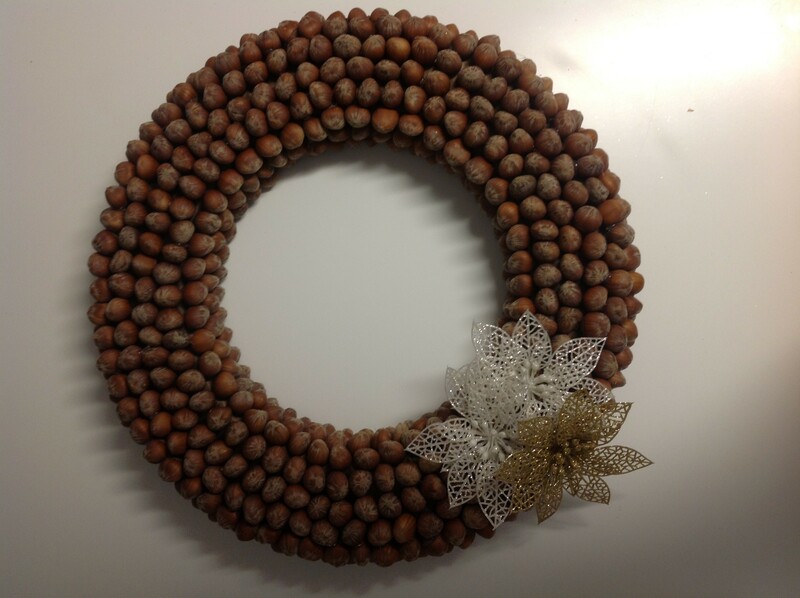 to get all those baby nuts there… When you are done, glue your final arrangement at 5 o’clock position in the wreath. Voila! This wreath turned out great! I prefer it over the pinecone wreath. Nice job!